Frank Sinatra - Ring-A-Ding Ding! 2015 Remastered Reissue on 180g Vinyl ! Three vintage Frank Sinatra albums from 1965 will be released on 180-gram heavyweight vinyl by Frank Sinatra Enterprises/Universal Music in November 2015. The 50th anniversary editions of A Man And His Music, September Of My Years (both Grammy-winners) and Sinatra '65 are the latest releases in the centennial year celebrations leading to his birthday on December 12. 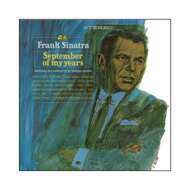 September Of My Years was originally released in September 1965, three months before Sinatra's 50th birthday. A No. 5 album with an epic 69-week chart span, it included the Grammy Award-winning classic "It Was A Very Good Year," aptly for an album that also took home the coveted Album of the Year Grammy.